And now they want to tell you about it. The folks at EMRCA are moving into a more public phase of their endeavor. While they’ve been inviting people to visit their offices and workshops at Heritage Park for many months, now their outreach will extend to a periodic newsletter, outlining the many fronts on which the work is advancing. X-RR will link to the newsletters as they become available, and – full disclosure – I will be working with the editorial board of the publication. So I’ll have inside sources while maintaining an independent voice. I don’t pretend to neutrality, however. I am an enthusiastic, if not uncritical, supporter of the whole North Adams project. Who’s been working on the railroad? Ben Sosne is Operations Manager, responsible for political and legal administration. Andrée Heller is Project Manager, responsible for programming, communication, and advancement. James Jarzyniecki is Chief Designer & Architect, responsible for the fabrication and construction for the model train installation. Raynor Sebring is Research Analyst, responsible for historical and educational content development, with particular attention to railroad history. William Docarmo is the installation engineer who has been instrumental to the project from Tom’s earliest inspiration. Who will be working on the railroad? This is the biggest news flash. Renowned architect Frank Gehry has signed a design development agreement with EMRCA and will be making a site visit to North Adams on 9/1/17. Besides designing a signature building for the model train & architecture museum, Mr. Gehry will consult on two related projects, the Mohawk Theater and the Hoosac River Revival. Meanwhile, former Massachusetts Governor William Weld has been retained, as principal of Mintz Levin Strategies, the consulting subsidiary of a major Boston law firm, to lead capital fund-raising and investment, as well as advising on corporate and governmental legal matters. Gehry and Krens, of course, were both primary contributors to the success of the Guggenheim Bilbao, widely considered the “most important piece of architecture built since 1980.” For their press conference in North Adams on September 1st, they will be joined by three former governors of Massachusetts; in addition to William Weld, Michael Dukakis and Deval Patrick are slated to attend. Dukakis initiated urban heritage parks including North Adams’ during his tenure, and was the first governor to greenlight MassMoCA, while Patrick’s support made its recent expansion possible. Tom is a master of the art of making connections – personal, conceptual, intellectual, cultural, practical – and a ringmaster (or taskmaster, as some might say) in enlisting individual talents in a collective endeavor. What work is being done on the railroad? On so many fronts – where to begin? Most basically, EMRCA has taken options to privately purchase from the City of North Adams both the existing Heritage Park and the adjacent parcel, where the abandoned Sons of Italy building is now and the Gehry-designed, purpose-built train/architecture museum will be. First, an economic impact analysis by the Center for Creative Community Development, led by Williams economics professor Stephen Sheppard, which projects more than half a million visitors, and the potential for a multiplier effect that would yield up to two thousand additional jobs in the region. Secondly, a Master Plan for Heritage Park redevelopment, prepared by Gluckman Tang Architects, which details the transformation of the existing buildings into a showplace Mount Greylock Distillery and a Museum of Time, as well as other dining, retail, and support facilities. In terms of documentation to draw believers in its core project, EMRCA has moved from its original Conceptual Development Study – a massive volume designed to deluge doubters with facts and bludgeon them into submission – to a slimmed-down prospectus that offers a concise mission statement spread over a portfolio of illustrations, designed to attract and entice investors and supporters. Most impressive is the double-gatefold layout of the track plan of the model train display, which covers an unbroken, high-vaulting expanse longer than two football fields. How is the railroad moving beyond words and pictures to tangible practicality? 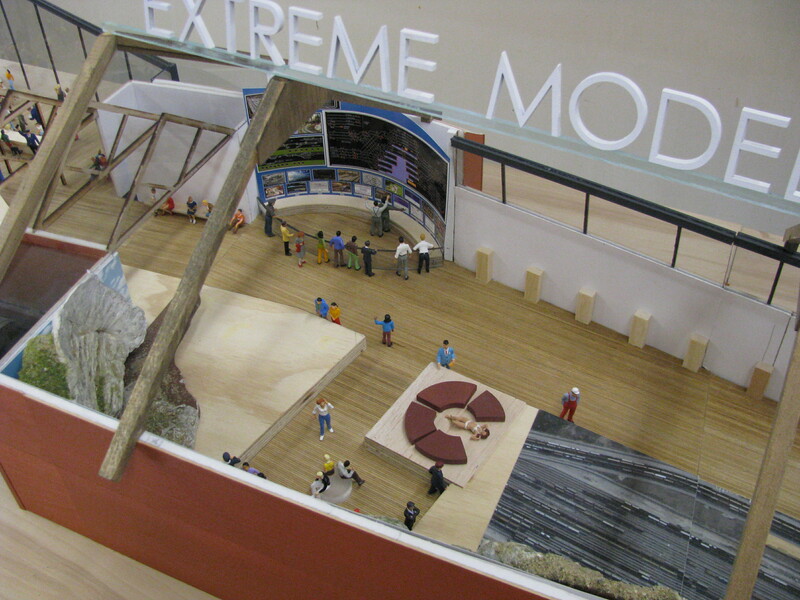 A thirty-foot 3-D physical model of the entire display has been created in 1:24 scale. An unauthorized first look is offered under the heading “The Model 2.0” above. The second floor of the EMRCA workshop at Heritage Park has been transformed into a test track platform, so the technical details of all sorts of crossings and couplings can be confirmed, using 2-Rail instead of the more common 3-Rail O-gauge, for greater detail and verisimilitude. At the same time, the curatorial aspects of the museum’s railroad and architecture components are being refined, with the determination of 164 modern architectural masterpieces whose finely-detailed models will be interspersed among more than a thousand generic buildings, and 107 historic steam and diesel locomotives that will run simultaneously. When will this train reach its destination? Frankly, that’s a question that only time and money can answer, but all preparations are underway to fast-track the project. The multiplicity and simultaneity of actions in process prefigure the immersive immensity of the final product.